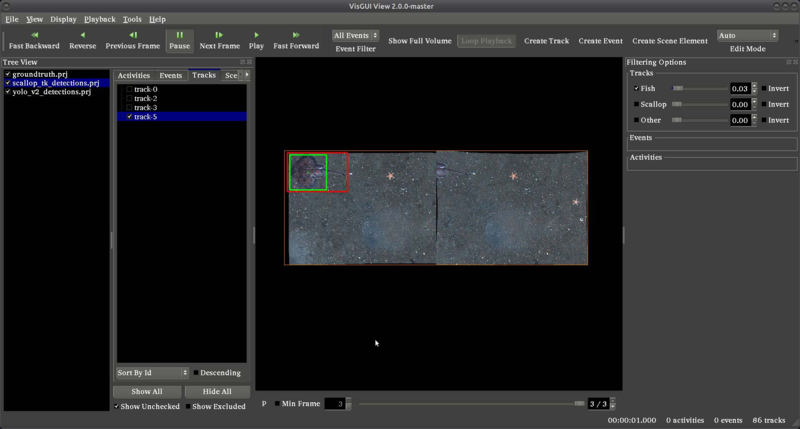 This document corresponds to this example online, in addition to the object_detection example folder in a VIAME installation. This folder contains assorted examples of object detection pipelines running different detectors such as YOLOv2, ScallopTK, Faster RCNN, and others. Several different models are found in the examples, trained on a variety of different sensors. It can be useful to try out different models to see what works best for your problem. Each run script contains 2 calls. A first (‘source setup_viame.sh’) which runs a script configuring all paths required to run VIAME calls, and a second to ‘pipeline_runner’ running the desired detection pipeline. For more information about pipeline configuration, see the pipeline examples. Each example processes a list of images and produces detections in various format as output, as configured in the pipeline files. Each pipeline contains 2-10 nodes, including a imagery source, in this case an image list loader, the actual detector, detection filters, and detection writers. 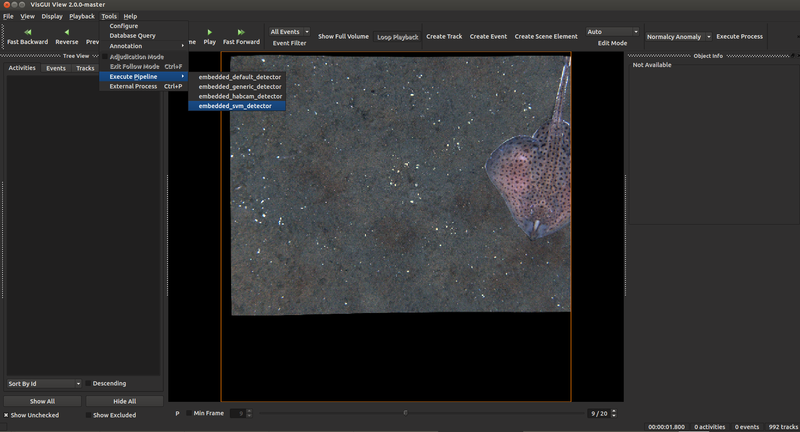 In the habcam example an additional split processes is added early in the pipeline, as habcam imagery has stereo pairs typically encoded in the same png. The annotation GUI can also be used to run object detector or tracking pipelines. To accomplish this, load imagery using the annotation gui, then select Tools -> Execute Pipeline and select a pipeline to run, see below. Special notes: the ‘habcam’ pipeline only processes the left sides of images, assuming that the image contains side-by-side stereo pairs, and the ‘svm’ pipeline requires ‘.svm’ model files to exist in a ‘category_models’ directory from where the GUI is run. New pipelines can be added to the GUI by adding them to the default pipelines folder, with the word ‘embedded’ in them by default. These are the build flags required to run these examples, if building from the source. In the pre-built binaries they are all enabled by default. you set :image_reader:type to vxl in each .pipe config. We will be using a Hough circle detector as an and example of the mechanics of implementing a VIAME detector in cxx code. In general, detectors accept images and produce detections. The data types that we will need to get data in and out of the detector are implemented in the Vital portion of KWIVER. For this detector, we will be using an image_container to hold the input image and a detected_object_set to hold the detected objects. We will look at how these data types behave a little later. Vital provides an algorithm to load an image. We will use this to get the images for the detector. The image_io algorithm provides a method that accepts a file name and returns an image. Now that we have an image, we can pass it to the detector using the following method on hough_circle_detector and get a list of detections. The detections, for example, can be drawn on the original image to see how well the detector is performing. The following program implements a simple single object detector. // Send image to detector and get detections. This sample program implements the essential steps of a detector. Now that we have a simple program running, there are two concepts that are supported by vital that are essential for building larger applications; logging and configuration support. Vital provides logging support through macros that are used in the code to format and display informational messages. The following piece of code implements a logger and generates a message. The vital logger is similar to most loggers in that it needs logging object to provide context for the log message. Each logger object has an associated name that can be used to when configuring what logging output should be displayed. The default logger does not provide any logger output control, but there are optional logging providers which do. There are logging macros that produce a message with an associated severity, error, warning, info, debug, trace. The log text can be specified as an output stream expression allowing type specific output operators to provide formatting. The output line in the above example could have been written as a log message. Note that log messages do not need an end-of-line at the end. Refer to the separate logger documentation for more details. In our detector example we just used the detector in its default state without specifying any configuration options. This works well in this example, but there are cases and algorithms where the behaviour needs to be modified for best results. The full details of the config file structure are available in a separate document. some circles may be missed. the Canny() edge detector (the lower one is twice smaller). accumulator values, will be returned first. Lets modify the preceding detector to accept a configuration file. // (6) If there was a config structure, then pass it to the algorithm. // (7) Send image to detector and get detections. We have added code to handle the optional second command line parameter in section (2). The read_config_file() function converts a file to a configuration structure. In section (6), if a config block has been created, it is passed to the algorithm. The configuration file is as follows. Note that parameters that are not specified in the file retain their default values. To further expand on our example, the actual detector algorithm can be selected at run time based on the contents of our config file. // (1) Create logger to use for reporting errors and other diagnostics. // (8) Send image to detector and get detections. Since we are going to select the detector algorithm at run time, we no longer need to include the hough_circle_detector header file. New code in section (2) initializes the plugin manager which will be used to instantiate the selected algorithm at run time. The plugin architecture will be discussed in a following section. First you will notice that the config file entries have a longer key specification. The ‘:’ character separates the different levels or blocks in the config and enable scoping of the value specifications. The “detector” string in the config file corresponds with the “detector” string in section (7) of the example. The “type” key for the “detector” algorithm specifies which detector is to be used. If an alternate detector type “foo” were to be specified, the config would be as follows. Since the individual detector (or algorithm) parameters are effectively in their own namespace, configurations for multiple algorithms can be in the same file, which is exactly how more complicated applications are configured. In a real application, the input images may come from places other than a file on the disk and there may be algorithms applied to precondition the images prior to object detection. After detection, the detections could be overlaid on the input imagery or compared against manual annotations. Ideally this type of application could be structured to flow the data from one algorithm to the next, but writing this a one monolithic application, changes become difficult and time consuming. This is where another component of KWIVER, sprokit, can be used to simplify creating a larger application from smaller component algorithms. Sprokit is the “Stream Processing Toolkit”, a library aiming to make processing a stream of data with various algorithms easy. It provides a data flow model of application building by providing a process and interconnect approach. An application made from several processes can be easily specified in a pipeline configuration file. Lets first look at an example application/pipeline that runs our hough_circle_detector on a set of images, draws the detections on the image and then displays the annotated image. # pause_time in seconds. 0 means wait for keystroke. Our example pipeline configuration file is made up of process definitions and connections. The first process handles image input and uses a configuration style we saw in the description of selectable algorithms, to select an “ocv” reader algorithm. The next process is the detector, followed by the process that composites the detections and the image. The last process displays the annotated image. The connections section specify how the inputs and outputs of these processes are connected.